One of the first comprehensive books on SMILE with an enviable video collection, providing an overview of the surgical procedure, its refractive and physiological outcomes, complications, their management and future applications. Concise tables, self-explanatory diagrams, clinical pictures and ASOCT images interspersed with the text to re-capitulate the important points and enhance understanding. In-depth description of the machine and laser settings, emphasizing the customization of treatment parameters in the ‘Expert Mode’ by the surgeon to achieve optimal outcomes. 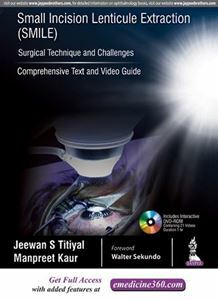 Highlight of this book is the step-by-step video assisted guidance to master the surgical technique, with integrated animations to facilitate clarity of concepts. Detailed description of the difficulties faced during the initial learning curve, the pre-disposing factors, preventive measures as well as their management. A reference guide for refractive surgeons providing an in-depth understanding of the procedure, with surgical tips and tricks. Chapters 5, 6, 8 and 10 contain video(s).